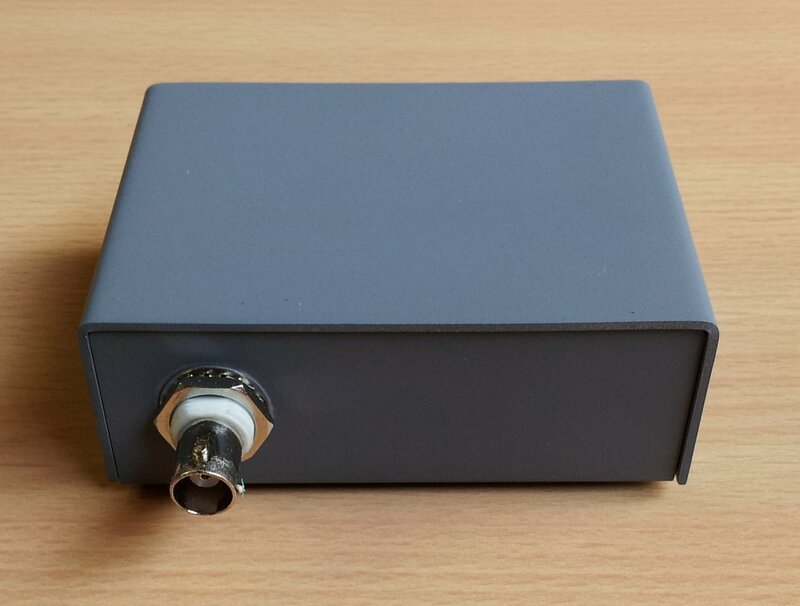 This VSWR analyser looked interesting from K6BEZ. Certainly simple and low cost and probably just the thing to test the multiband SOTA antennas that I have been putting together lately. I happened to have one of the DDS modules spare and would change the Arduino module in the article to a Nano as they are compact and cheap (~$10). 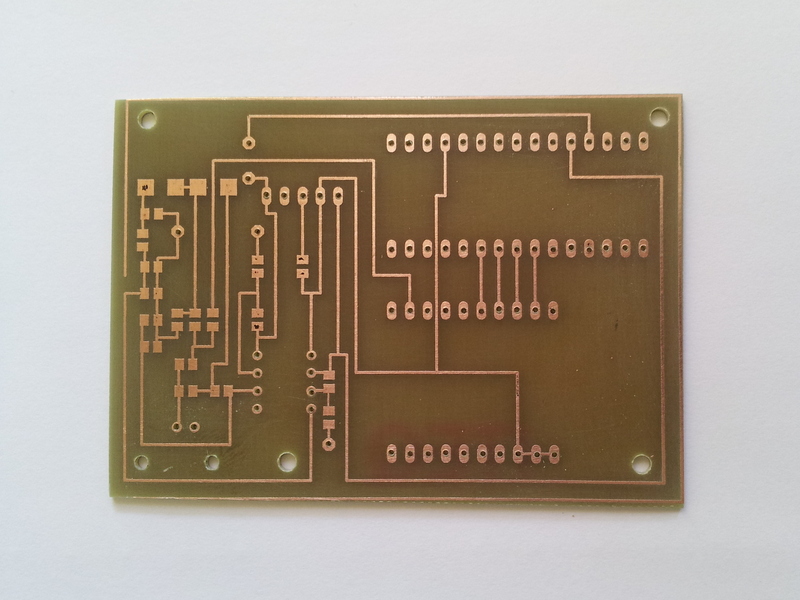 Rather than build it on veroboard as per the article, I made a PCB using Eagle and the toner transfer process. The board is mostly SMD to keep it compact and these days SMD is easier anyway. The board came out nicely, it is single sided and only has one link. It uses the entire bottom copper as a ground plane. 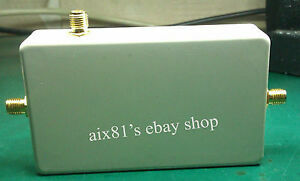 I couldn’t source the AA143 germanium diodes locally, so picked up a couple of 1N34a diodes. In summary, there is an unused field that has to be removed for the newer sweeper software and the FWD and REV fields are not used. Update 2014-09-30: 1N60 diodes made a noticeable improvement over the 1N34a diodes. 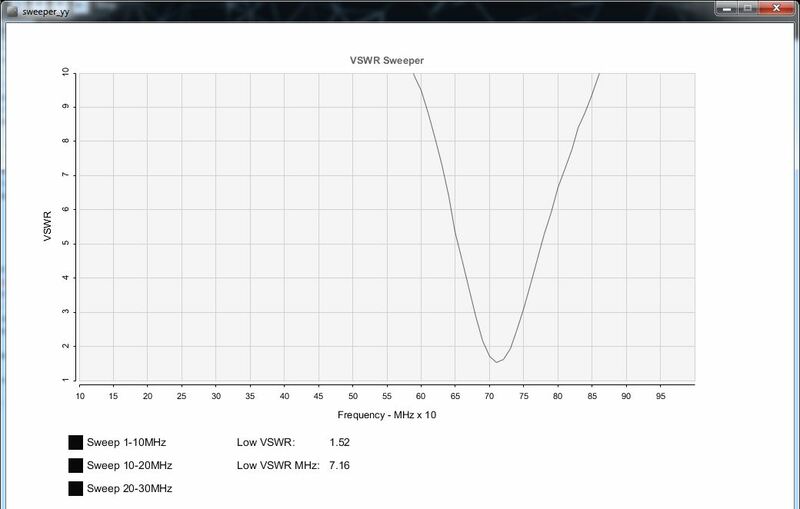 There is still a rolloff in the plot when the analyser is unterminated, but VSWR is now reported out to 30MHz that correlates with the VSWR measurements using a bridge. Update 2014-10-05: The analyser was hooked up to the SOTA End Fed Half Wave to see how it looked. A 10m feed of RG58 was used. The result is pretty good. It seems to be working OK now. 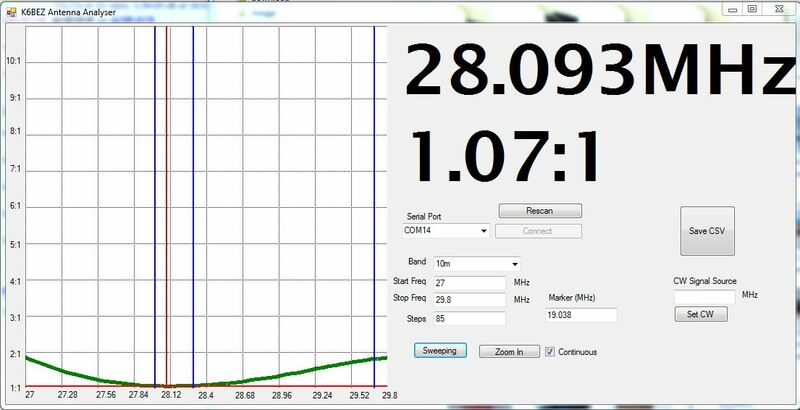 The antenna was originally optimised for 7.090 MHz and it is damn close in the plot. Update 2014-10-10: Changed R6 on the DDS board from 3k9 to 2k2 which resulted in an increase in DDS output. With 3k9, the output loaded to the sweeper was 600 mV p-p. With the 2k2 the output increased to 1000 mV p-p. This change increased the sensitivity of the analyser noticeably. Update_20114-10-08: The PC program won’t run on my Windows XP netbook, which makes it difficult to do measurements outside. After some software programming using processing, I have a multi-platform capable application that will at least run on the old netbook. The application is pretty rudimentary, but plan to work on it and clean it up a bit. At present it will only sweep a few pre-defined ranges as the graphing is rather basic. I am using the grafica graphing library for processing to do the plotting. Here is a plot from a 40m end fed half wave. The processing application is working pretty well now. I have divided the sweep into 3 bands, 1-10 MHz, 10-20 MHz and 20-30 MHz. This was pretty easy to scale. I might add the HF ham bands later. It does run on the old XP netbook just fine. Update 2014-12-06: Lars, KN5UTE did a great job of cleaning up and enhancing the user interface on my processing version of the sweeper software. The com port can be selected now where as before it just chose the first com port it came across. It still won’t compile to an .exe for some reason, so it is still running out of the IDE. 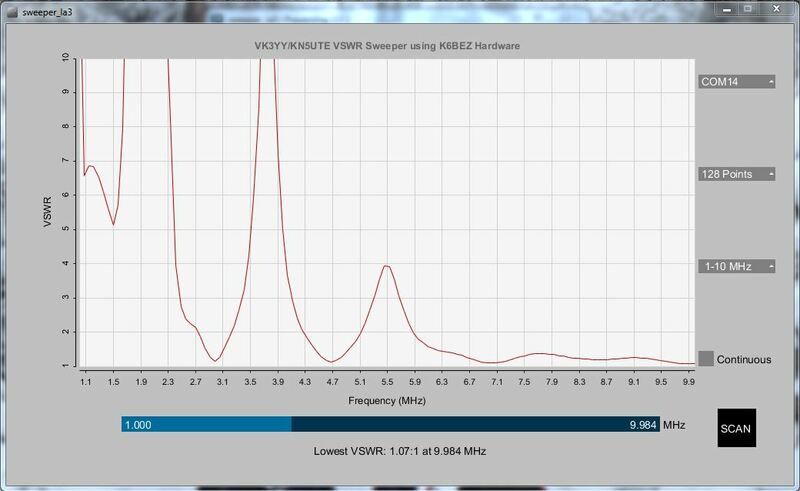 The VK3YY/KN5UTE software can be found the software is in the files section of yahoo groups “K6BEZ Antenna Analyser”. Update 2015-01-04: Received some AA143 diodes in the mail from KN5UTE, tried these out and there was a slight improvement at the 30MHz end compared to the 1N60A diodes. I will leave these in. 2015-04-22: changed the download link to dropbox. 2015-12-28: added image of component side of PCB to show which through holes are grounded on the other ground plane side. 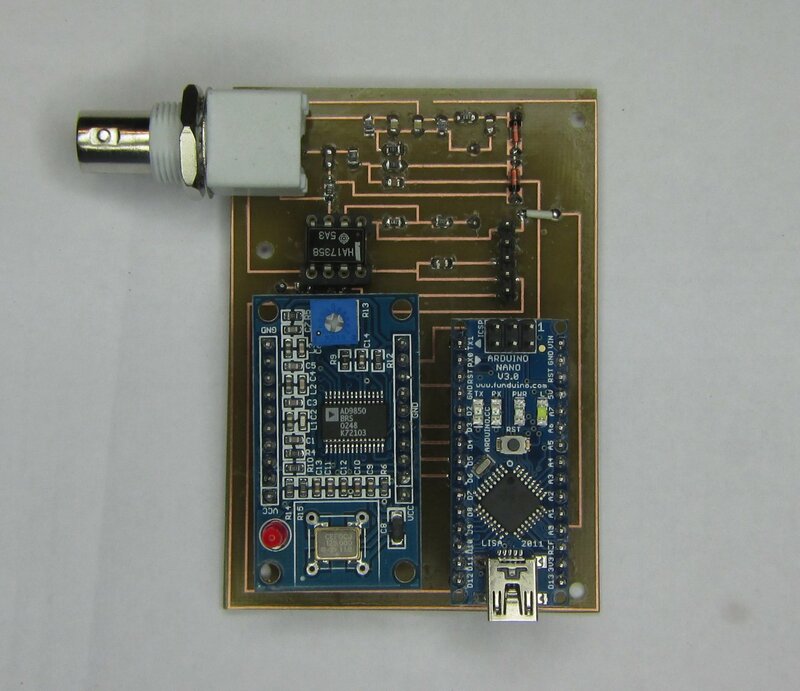 This entry was posted in Projects and tagged AD9850, antenna analyzer, arduino, DDS, k6bez. Bookmark the permalink. Thank you for your extremely helpful blog post. Though I’ve never built electronics before (no less solder) I’m going to try to source the materials and build this for myself. If you have a bom, could you make it available on your dropbox? Also, forgive me if this is an extremely naive question, but what is the white [thing] (is it a wire/resistor?) next to the diodes. I looked at your schematics and can’t find a reference for it. Good question about the white thing! It is just a wire link with some insulation over it so that it doesn’t short to the tracks that it bridges. It does look like a component though. I don’t have a BOM unfortunately. Cheers, Glenn. The connectors are labeled SV3 what is its role? Connect any external source of energy? ThanksVK3YY and Lars. I use linux system and open jdk. Control P5 is 2.2.5 ver. I have resolved a few issues with trial and error. Now the serial port selection is giving a large number of errors in the console. Same way all dropdowns are producing a number of errors. Let me try some other Java. I will let you know about the changes once it works. This is the console output. Can you guess something from it. After some more tinkering I managed to run the sweeper. I will send it on email. It is the new controlP5 library expecting different ways to handle the event handlers. I did upload the modified version of your processing code on the yahoo group for K6BEZ antenna analyzer under VU2SPF folder with your original notice, and without adding my info anywhere in the sketch. I don’t know if your permission was needed. In case you have any objection to my upload, I will remove it and do as per your instructions. I apologize if I have trespassed on your rights somewhere unknowingly. I could not find your email anywhere, so putting up this message here. Hi, ok on the upload. My permission is not needed to upload a file to Yahoo groups files section as I have no control over the content of that group. I have no objection to posting modifications to the sweeper processing code to Yahoo groups. Lars has made significant improvements to the original code and good to hear you have it running on a Linux platform. Thanks for your kind gesture in true ham spirit. I have also added another slider for VSWR below the one for freq. That helps when your antenna is well tuned or when VSSWR is small. By the way, any plans to add an amp before the bridge to improve sensitivity? I found one at http://www.pongrance.com/dds-buffer.html and used in one of my arduino dds. It gives signal of 5Vp-p, which should be enough for this analyzer. Hi, no plans at this stage to add an amp, the analyser works fine for my needs, great on the extra slider. Did you ever change from the 1n60 diodes to the aa143’s? Hi Kevin, yes I did change them to AA143s. There was a slight improvement at the 30MHz end over the 1N60 diodes. Thanks for the reply – I saw that you had done so (after I realized I was searching for AA123 instead of AA143). I’ve ordered the 1N60’s – I’ll get the AA143’s if I’m not happy. 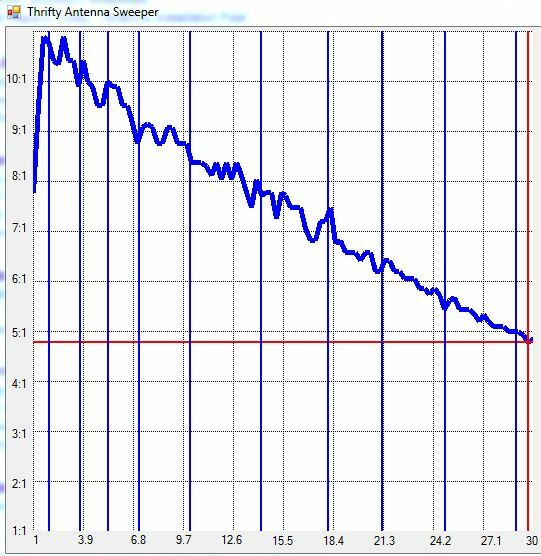 Trying to put a club project together and finding analyser is showing lower readings than MFJ analyser, the ‘dip’ agrees but the higher ends of the curve are not as high as from the MFJ. We have used 1N34 diodes and then 0A47 with some improvement. 1N60 diodes on order. Have you compared your unit with a commercial analyser? Will be interested to see how your 1N60 diodes compare. The analyser is not that accurate in absolute VSWR, presumably due to the linearity of the diodes and operating at their lower forward voltage range. I did some plots with 50 and 100 Ohm resistors and noted a departure from what it should have read. On the PCB are there 3 holes, with no components, are these three holes link to the bottom curcuit ? 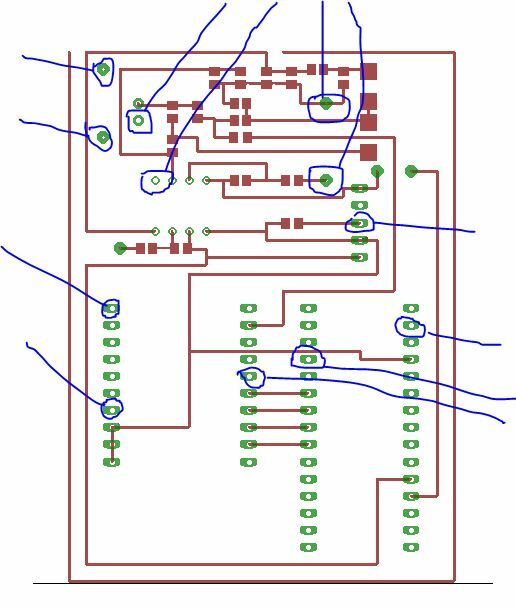 Hi Lars, I added an image at the end of the article that shows the holes that are links to the ground side of the PCB, this should explain it. 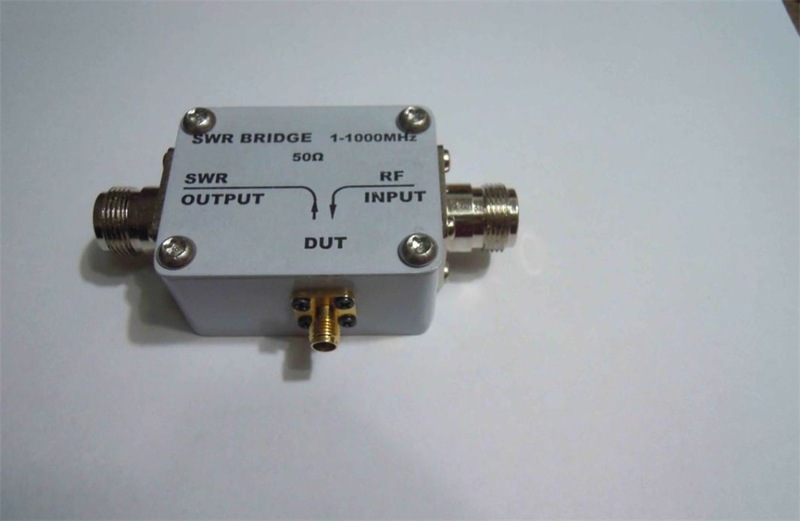 i have a SWR Bridge purchased from ebay. Why we not we use the same in place of swr bridge in circuit?.This will eliminate some headache due to availability mcp6002 and aa143 etc. I build one. Working well. 648OHM (R7,R11) combined with 13K+680OHM in parallel. I was miss the comment that R4 must be 10K. I spent few ours to find the error. Thank you for project description. Great to hear it is working !!! I can’t find the R6 with 3k9 in your schematics can you tell me again which resistor you changed? If you click on the photo of the analyser pcb with the DDS module on it, towards the lower right end of the DDS module you can see the part labelled R6. I guess I have a different DDS board. Do you have the schematics of your board so I can figure out, which resistor I have to change on my module? Hi Julian, I have emailed the schematic to you. Kevin – I had to trouble shoot my project as well. 1. I hooked a cro to the ad9850 sine wave output. Make sure that it gives a clean sine wave first. ( There are lots of places on the net to make a circuit to just check the ad9850 works) Most problems here could be the connection to the data,clock,reset,update pins – check you altered the clock and update wires which were originally shown the wrong way around. Make sure also that the connections go to the right pins on the uno. I had some problems with a uno and replaced it with a Leonardo. 2. Then found that I had to put a 1mf electrolytic capacitor in at c1. The 2*470 nf didn’t work. This gave a clean sine wave at the output side of c1 but a saw tooth wave at the antenna output. The graphs produced were inconsistent – see my other post. 3. Next I had substituted the 50 ohm resistors with 56 ohm ( R1,2,3 actually a little higher value). When I substituted 2 * 100 ohm paralled in each place to make 50 ohm the output signal cleaned up to a sine wave. 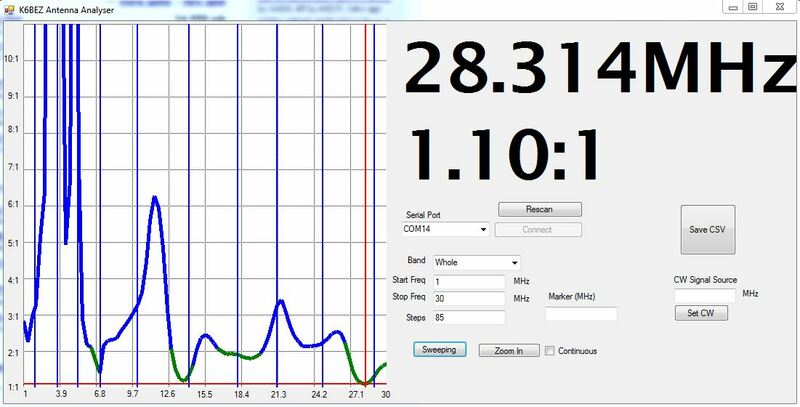 I then replaced c2 and now have a lovely clean sine wave at the antenna output as the sweep is executed. 4. I find that the sweep sine wave out put decreases rapidly after 24 MHz and my unit does not give a good reading on the 10 meter band. I think because the output from the ad9850 drops to under 1 volt p-p. However the graphs now on each sweep are consistent and show the swr dip in the same place each time. I would love to try against a professional antenna analyzer to see the difference as this project makes a great unit that really works. Thanks for the great info here. This is a Great project – love the DDS modules. The code gives great control of the AD9850 – watched the sweep on a cro and it gives a smooth controlled frequency shift – the sine wave is very stable, clear and clean. The data is returned and a graph produced – However, when I run the code the sweep returns a different set of values for each time the sweep is executed. I have checked the code and the circuit now several times. Odd I dont get a wave form at the antenna socket that is a clean sine wave it is a saw tooth shape. Should it be – does anyone have a screen shot of what the output at the antenna socket should look like? I found that the 1 microfarad electro capacitor that I had substituted with 2* 470nf ( total .94mf) ones in parallel didnt work well and it has made some difference when removed and a 1mf electro fitted. Each sweep now gives a graph with dips in much the same place each time. Still the swr readings returned are quite dis-similar each time a sweep is run. Does any one have any thoughts? The only other parts substituted were 56 ohm resistors for the 50 ohm resistors – will try 2 * 100 ohms to get a closer approximation tonight and see if that makes a difference. 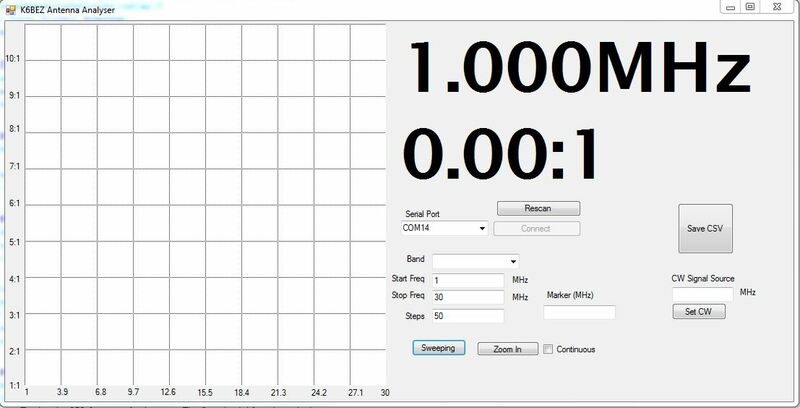 Question on your setup – do you get a 1:1 reading if you are driving a 50 ohm dummy load? I just built something very similar and am trying to figure out if it is working – but am not getting 1:1 there. Yes, I get a close 1:1 reading into a 50 Ohm dummy load. 1. Do you need to upload additional code to the Arduino to make it display on a PC as long as the sweeper program is downloaded onto the PC. 2. If I decide to use an LCD instead of a PC, do I need to upload additional LCD code to the Arduino, or is it included in the Arduino code that is posted. 3. Can I use a Raspberry Pi 3B with it’s display instead of a PC. If so, do I need to upload additional code to either. 4. Since the Arduino only runs the last code uploaded, how can I upload any additional code that might be necessary for the display, if it’s not included in the main Arduino project code. 5.I am assuming that the usb port on the Arduino is used for connection to the PC or raspberry Pi. Am I correct. In other words, I understand the project and the concept, but, being new to microcontrollers, I am very confused about how to display my SWR information. Sounds like a great project for an old extra-class operator who is trying to “modernize his electronics knowledge base. Heck, I started out with vacuum tubes, ha ha! Hopefully I’ve expressed my questions intelligently enough for you to understand what I’m after. Try not to laugh too hard! 1. Yes, there does need to be Sweeper code in the Arduino in addition to the PC software. 2. Yes, there will need to be specific code in the Arduino to drive an LCD display. 3. Possibly, but you will need software to run on the Pi to interpret the data from the Arduino. 4. You will need code that does the sweeper and the LCD together. 5. Yes that is correct. Your questions all make sense and understand why your are asking!! Thank you, sir. I will get to work straight away, Hopefully I an pull this one off without too much bungling. I appreciate the speedy reply, It is most obvious that you are a fine gentleman. Have a great week, and, again, thanks! Daft question. Is this a single sided piece of copper board, just printed on one side? also is this the final board for the altered/replaced components? It is double sided board etched on one side only, the other side was masked when etched so it is a full ground plane. The final components are not shown on the photo. The op-amp and diodes were changed. Cheers..
Hi Peter, he only PC display software that I use now is the VK3YY/KN5UTE software and this only has a red line for the plot. Where is the blue line? Do you mean the slider line at the bottom? Which display software are you using? I am using the K6BEZ software. The blue lines are apearing vertical. Where can I download the vk3yy/kn5ute software. Do I need to change the arduino sketch or hardware? Otherwise the sweeper works great. Hi Peter, the vk3yy/kn5ute software is in the files section of yahoo groups “K6BEZ Antenna Analyser.” I should put a link on this blog. The code on the blog works with the vk3yy/kn5ute software. The blue lines are probably markers for the amateur bands. here is a dropbox link to a zip file that contains the code. it is a Java executable, that means that although it is an .exe file it relies on java libraries that are also provided in the zip file (linked). you must leave the .exe in the same relative directory position as the lib folder that contains the java stuff, otherwise the .exe won’t find the necessary libraries and will crash. you CAN however, make a shortcut to the .exe from somewhere else, just don’t move the .exe relative to the lib folder. good luck to you, it should work fine on xp. if you _do_ have problems with it, the first thing to try is to see if your java installation is current. Thanks Lars! hope all is well over there. I thought there was a link to the code but had a look this morning and couldn’t see one. I finished my one last week and it is working very well. I want to use the same approach to display the filters shape and so I will make the resistors bridge board interchangeable with an AD8307 detector. What PC program should i use to display the filter respons ? What modification is needed to the Arduino software ? Thanks in advance for any suggestion . I have completed my analyzer last week: congratulation it is a great project.and works well. There is a point: it locks_up after few minutes if in continuous scanning mode ( win 7 64 bit ). I have now in mind to modify the circuit by introducing ann AD8307 detector to display the filter response shape.. I plan to make the actual resistor bridge interchangeable with a small detector board. At this point I will have just one analog out to send to Arduino. >> what program should i use for PC display ? >> what modification to the Arduino software ? Thanks a lot in advance for the assistance. Hi Ambrogio, are you using the VK3YY/K5UTE PC software? This is the only PC display software that I have been using and it did not have any lock up problems. The Arduino code on the blog is compatible with it, Cheers, Glenn. This project is really great ( BIG THANKS TO ALL ) – I have built several units. They all worked straight up – oh well after a little troubleshooting but it is very easy to fault find. This works with all versions of Arduino both originals and clones and I have tried 15 – 20. you only need to tweek the code to work. The original mega and mega clones are a little more obstinate than others requiring more code changes. A problem I am finding is that each unit is different in the figures that are produced. How can I check the accuracy of the results output from the units? It sort of defeats the purpose if I have to buy a MFJ etc to check the units that I make. 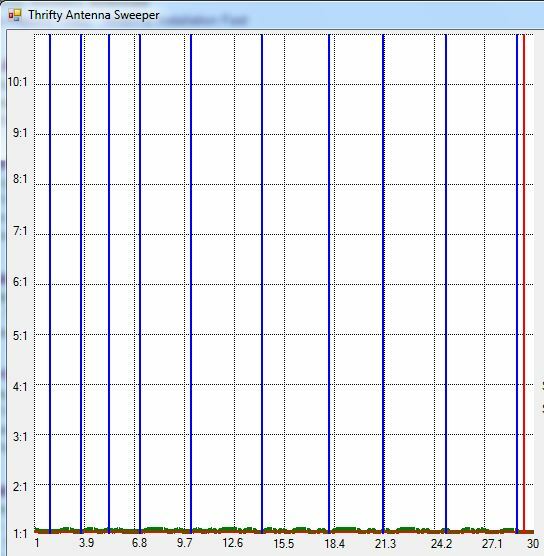 To explain – I tested by attaching the same antenna to each unit and found that each unit gives slightly to significantly different results in the graphs produced when attached to that same antenna. Circuits all being identical – except for 5% component tolerances. When I say each unit is different, I mean the basic peaks and troughs are mostly similar but they range quite a bit in the frequency shown and the SWR measured and in some units some peaks or troughs shown from one are not shown in the other. Hope that makes sense to readers. 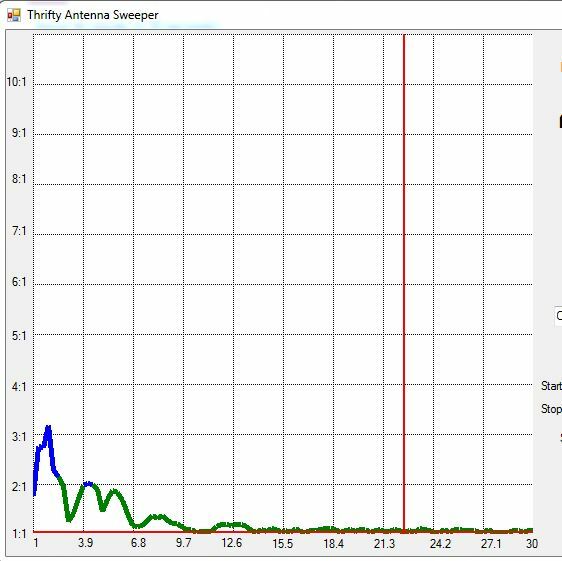 I have tested the AD9850s and found that they produce the same frequency sweeps to within 200 hz of each other as they sweep. I still need to find out how to tweek the AD9850 to get closer to each DDS module being exactly the same, as it is given the same word to make the output frequency. I have also been working with the code from here in an effort to make the unit more portable. So far I have modified it to work with 20 char * 4 line i2c lcd display showing sweep fx, lowest SWR and FX for the SWR, SWR as it sweeps and am working with TFT displays to expand further. Next experiment will be keypad entry to remove further from the laptop. Although I love the big laptop screen graph. Has any one experimented with the code to run on a TFT display and draw the results there and be willing to share their experience? Has any one experimented with the circuit to show line characteristic impedance as well as SWR? open input gives 15.8 : 1 , should be very high or infinity. has this something to do with the offset of the LM358 ? The things you have found here are the same as i am working with at the moment. I surmise that the LM358 has it been substituted for the MCP6002? I have found that the voltages supplied from the ad9850 make a difference to the swr readings. I placed a broad band buffer amp after the 1mf capacitor and have a different set of swr readings. Much higher swr readings and much deeper troughs. It also helps the frequency readings above 15 mhz to be more pronounced. I am examining the code at present to see how the SWR is calculated from AO and A1 on the arduino. Its back to the books to understand the maths for the calculations and how the bridge works. I would be interested in sharing any thoughts or information that you find. Thanks for the link, great stuff! i will like to remove the diodes and the two op amplifiers and replacing them with a couple of AD8703 detectors. What do you think about ? Sounds great, that chip should make the antenna analyser much more accurate! Sounds like a great idea, you should get much more repeatable and accurate performance. just to be sure of my circuit operation: what is the voltage at the DDS output ? What is the voltage at the two transistors amplifier output ? I have also find that the ampl out goes down about 10 dB at 30 MHz: is it normal ? Hi, one of the weaknesses of the design is marginal output from the DDS. I am not at home at present, so cannot check notes or the unit itself. A broadband amp after the DDS would improve performance and keep the diodes operating in a better region. difference in the liniair piece on the diode char. could someone post the schematics for the connection of the two AD8703 detectors please ? I think this is going the right direction. I tried using 2 bc547s for the broadband amp but they demonstrate some odd wave forms out – even disappearing at certain frequencies. Started adding the unit to a TFT screen. What an interesting experiment. So many different TFT screens and they all seem to need different drivers and different wiring for the same chip sets. This drop seems to be normal for the DDS modules that I tried. The voltage PEP goes down gradually as the frequency output increases. Some DDS modules are better than others and some are different in frequency output with the same code word sent. I have been trying to get a consistent voltage output for the full range 1-30mhz but am beginning to think that it may need to be broken up into segments to adjust for consistency. I find that the graphs produced start really well – the peaks and troughs show well but at higher frequencies it drops (gradually above 15 mhz). I am sure that is from the DDS module output level. A buffer amp produces much higher peaks and troughs across the entire range of frequencies. It has to if you look at the formula that calculates the display swr. (fwd+rev)/ (fwd-rev). The only way i made contacts with VK was using WSPR , here from PA Holland. oke i keep contact or send some foto’s over email. Well I am convinced that the output DDS must be more for more working in the liniair area of the diode ,so amplifying the DDS O/P to max ADC level to arduino ( 3.3 V no more!) by open input antenna input. at the antenna input 50 Ohm ,is still 1 : 1 , but the scale is more or less dependent to the diode characteristics , wel first amplifying then and looking for better diode working-point. for now to busy with the grandchildren and family. Hi Peter, yes, you are correct, the output from the DDS is marginal at best. It can be raised slightly with a resistor change, but the best approach would be a gain stage after the DDS. and so it is better, i got interested for a AD8307 dB liniair detector and made a better and wide range detection and a return loss bridge, thanks for the interesting project. I see the instructions say you can replace the AD board with a SI oscillator for “higher frequencies”… I see this setup all over…has nobody ever done/documented something similar that would work for VHF/UHF? Hi Justin, it should work, the SI clock generator produces more output than the DDS, so it would be a good approach. The layout would become more critical than the HF sweeper. Thanks for the write up, I could not have built it without your excellent instructions, however I have found a small problem. After I built your design of the antenna analyser I have had problems getting it to give me a vswr of 1:1 on a 50 ohm dummy load. I originally put some correction factors in the code. This was fine until I went to test my antenna on 20m wavelength. I started getting minus numbers in the csv I had produced from the test in the VSWR column. A few hours of digging and experimentation led me to an error in the code for the arduino mini. The initialisation of the FWD and REV variables turned out to be incorrect. How it works is that arduino will return a number between 0 and 1023 whenever you do an analogRead() call to a pin, the number depends on the voltage present at the pin. When the variables were initialised as a double it was causing an issue because when cast back to an int again it will cause an integer over run fault and a negative number will result. Once I had changed the code so that FWD and REV were initialised as an int everything was suddenly working and my testing with a dummy load produced a VSWR of exactly 1 every time. I hope this helps the accuracy of the analyser. Hi Dave, great find. I have often seen the VSWR swing wildly on the plot under certain conditions, your fix matches the symptoms. I think that Lars, KN5UTE mentioned of a similar error in the arduino code. I tryed to changed the code as you wrote. but the outcom was not good. The graf is not smooth any more. It looks like squeres. So I am back on the original ino file again. It tried your change of making the double an int, but the result was truncating of the level so that it had largish steps on the plot, so changed it back. Cheers, Glenn. Ah, yes… Oops apologies all. I have made a mistake. It should be a float cast and not a long. A long will truncate the decimal point. Could you please post the final software release ? There are only 3 changes to the original code which is found above in the DDS Arduino Code link. If you do the above on the stock code it should all work for you. I am sorry, I currently do not have a web site and I can’t attach a file here and I won’t paste the whole code in a comment. Dave: I do not find any int at line 153. Just to be sure : will you pls post the whole code ? Which program do you use on your PC? an interesting project that I would like to do. but I like to solder components on PCB’s rather than holes on a fiber board. PCB’s are much more neater. I have done kits before but have never made a PCB. So where can I get a PCB made? northriver.se have ready made pcbs. Thank you for the reply and link. I have a problem. When I click on a link in northriver.se I get a message (could not perform this operation because the default mail client is not properly installed). I had to replace the HDD in my laptop recently and reinstall windows 7. But I cannot seem to find and or install default mail client, Therefore I cannot open any of the links in northriver.se. Any comments to help would be appreciated to get to the links. I wanted to put one of the kits together and I thought the analyzer project was proven and finalized, but It appears from reading the whole thread that this it is still in its infancy. From reading the post it seems many if not all are having trouble getting the analyzer to function properly after following K6BEZ’s design. Hi, I like the fact that you posted eagle schematics and design. Toner transfer is not new to me. 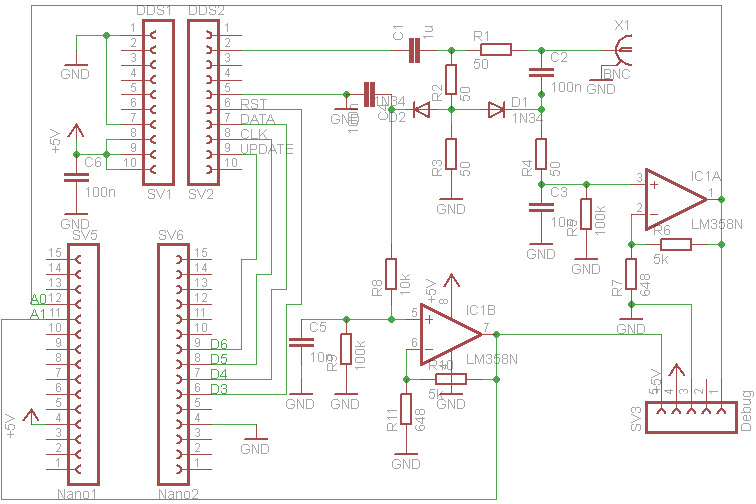 However I don’t understand this, the schematic has lm385N two times and the pcb has it one time. Now I can’t completely make up wich resistor/condensor goes where? What am I overlooking? Hi, the design has a dual package chip, so it has two op amps in one package. I used an LM358 first (dual op amp) but later used MCP6002 (same pinout) it is more suited to the application. Glenn. Hi, I am not sure of the question, is R11 missing from the grounding diagram? I want to use sweeper la3.pde and processing software. I used it before without any problems. I tried it on win7 and win10, last version java but It did not. Hi, they were the original values from K6BEZ, they are scaled to bring the DC rectified voltages into a reasonable range for the A/D. The ratio is important as it sets the gain, the two inputs should have the same gain. Cheers. Hi, I’m ordering all of the parts I will need to build this circuit and I am looking at the frequency range of the AD8950 and the datasheet shows a range from 1 to 125 MHz when running at 5 volts. Is there any way to modify the circuit so this can be used up into the UHF range? Is there another DDS and accompanying circuit that would be more suited to building an analyzer for 2 meter and 70 centimeter hardware? I will still be building this circuit as well because I simply don’t have the money right now for a professionally manufactured antenna analyzer for HF hardware, I’m just wondering if, going forward, anybody has come up with a solution for higher frequency stuff. Hey There. I discovered your blog using msn. This is a really well written article. Iâ€™ll be sure to bookmark it and return to learn extra of your useful information. Thank you for the post. Iâ€™ll certainly return. Thanks for *all* this. I’m a relatively new ham (passed the exams in April 2017), and pretty new to playing with Arduino. I found this blog after building this then almost giving up. There’s a lot of very helpful info here and I’m very grateful for it!